wonderful flavor and serving it with toasted bread makes this one of our favorite morning meals, and it's been in our routine for a very long time! 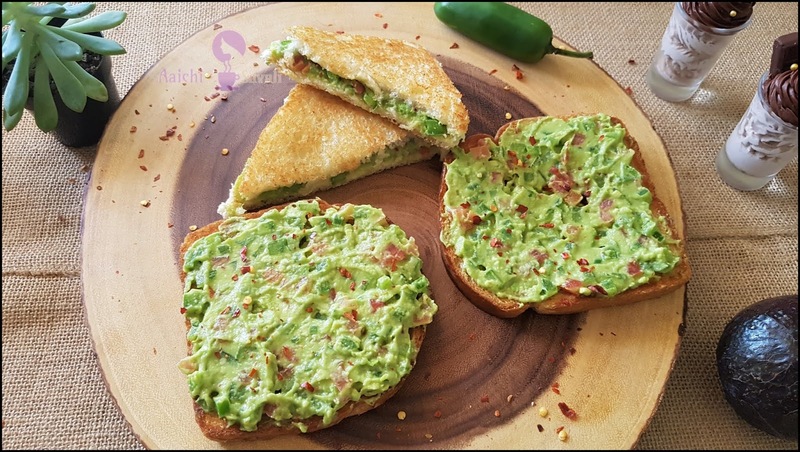 You won't be able to resist these creamy avocados and crispy bread taste that doesn't take hours to achieve. Avocados not only taste delicious but are also packed with lots of micro and macronutrients. Eating a good that contains plenty of fruits and vegetables of all kinds has long been associated with a reduced risk of many diseases. Avocados can help to decrease the risk of heart disease, obesity and promote a healthy lifestyle, increased energy. Avocados are full of healthy fats that help to keep you full and satiated for longer and aids in weight loss. So this crusty toast only calls for a handful of ingredients and has big flavors. 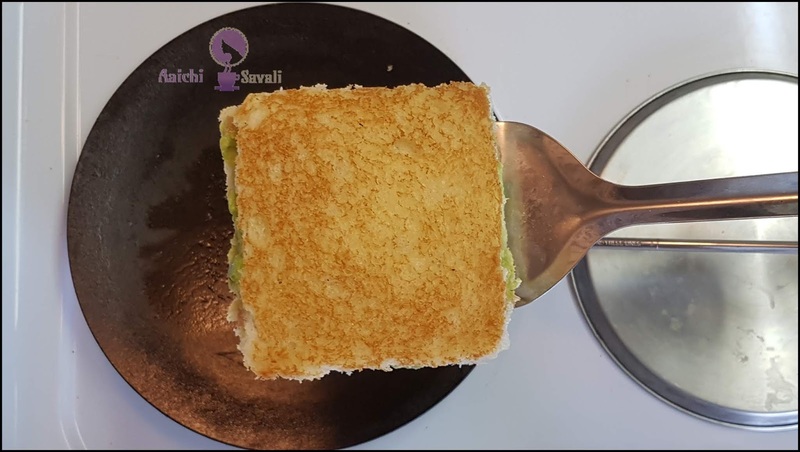 Here I have not used a sandwich maker or press to prepare these crispy sandwiches. Actually, you don't need a sandwich maker to make a top-notch toasted sandwich at home. All you need is frying pan /nonstick tawa. The chili flakes are really optional, but I like to use them to ice up sandwich a little, but you could easily go without. If you are following a vegan diet, then feel free to use olive/coconut oil to grease bread instead of butter. Or if you like to keep things like low fat as possible, toast them without oil or butter. So let's start. Preparation and Cooking Time: 10 Minutes. Each serving contains 120 calories. In a bowl combine mashed avocado, green pepper, tomato, jalapeno, lemon juice, and salt. Now, take bread slices and spread 2 to 3 tbsp prepared avocado stuffing. Cover with the other bread slice, press gently and spread butter. Toast bread on medium flame on both the outer sides of bread. Cook till bread turns a crispy and golden brown color. 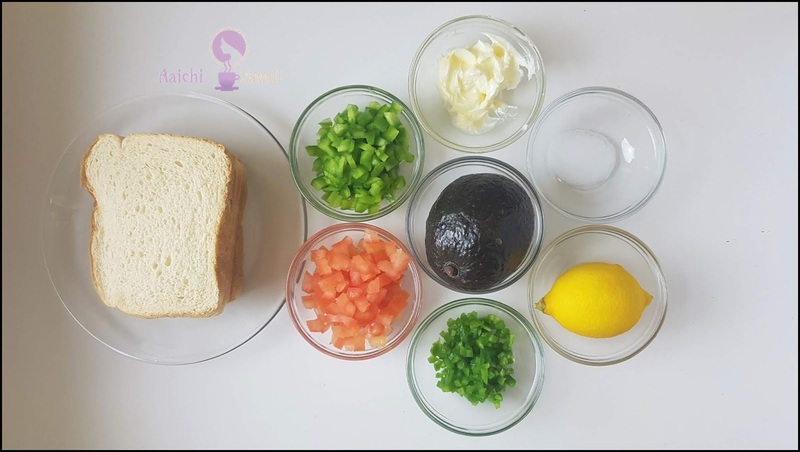 Tadaa, quick and tasty breakfast is ready to serve, cut the bread into half and serve hot. Spread butter on both the sides of the bread slice. Toast on medium flame, until it becomes crispy and golden brown in color. Now, spread 2-3 Tbsp avocado mixture on the toasted bread. Sprinkle chili flakes, and it's ready to eat. Enjoy!!! You can add onion and veggies of your choice. You can add green chutney or tomato sauce before adding avocado mixture. Make more or less spicy according to your taste. It makes 4 servings, and calorie count is based on a 2000 calorie diet. Per serving contains 120 calories, along with 16.72 g carbohydrates, 5.85 g fats, and 2.56 g protein. It is loaded with healthy fats, fiber, and micronutrients like various vitamins and minerals. They are high in monounsaturated fatty acids that are heart-healthy fatty acids. They are rich in fiber and fiber have essential benefits for weight loss and metabolic health. Avocados are high in antioxidants(lutein and zeaxanthin), which are very important for eye health and lower risk of cataract. It is good to eat avocado sandwich and toast for breakfast, lunch, snack and even for dinner. You are most welcome Smitha. Good to know that you liked it. For sure do try it and let me know how you like it.